This is some work in progress, which I am hoping to complete, time allowing, in the foreseeable future. 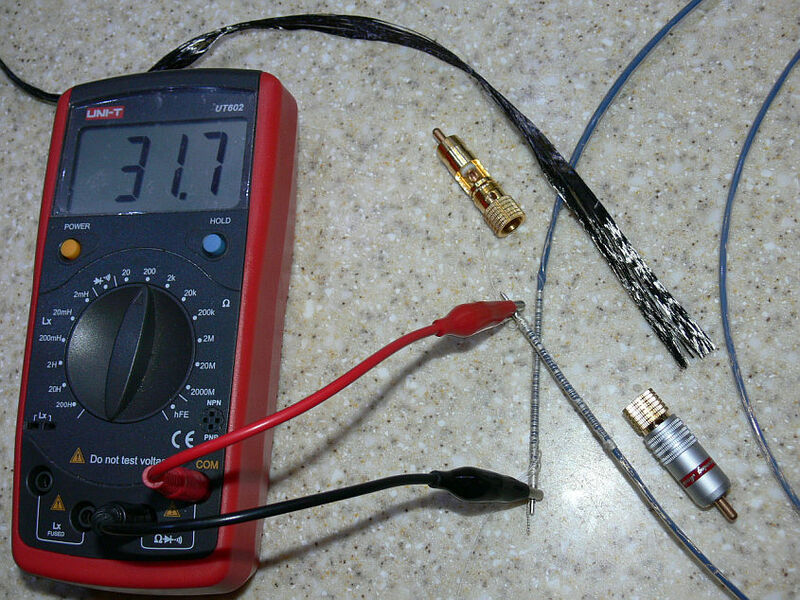 I am constructing an interconnect, that does not contain any metal within the length of the cable. 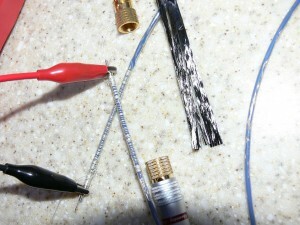 As can be seen on the photos, I already have prepared the first strand of the interconnect. It will be the “hot” signal wire. There are some home made DIY line end fittings, accomplished by means of a 2 mm solid core piece of silver wire, inserted into the insides of the teflon tube. This wire, with appropriately grinded ending, forming a smooth cone, has been inserted into the end of the teflon tube and at the same time works as a wedge that applies pressure upon the conductive fibers. This pressure provided a very good connection already, even without the additional wrappings from the outside. The wrappings are of a two-fold nature. a). On the end piece, with no teflon sleeve, I used a small diameter silver wrapping wire to tighten the conductive fibers onto the 2mm dia central wedge wire. b). on the remaining length of the teflon sleeve, across the whole length of the “wedge” central 2mm wire, there is a robust cotton thread that has additionally tightened the teflon upon the fibers that are inside. 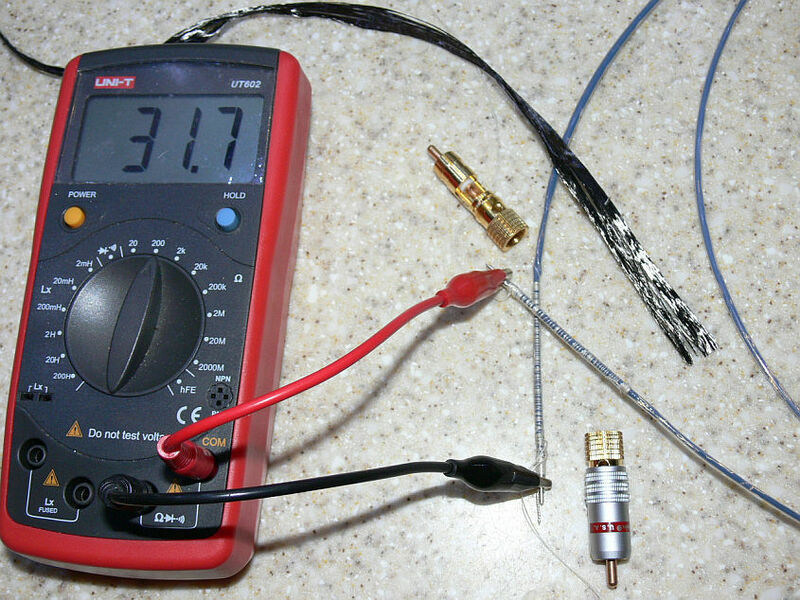 As you can see, a length of about 2 meters of such non metal conductor has about 31,7 ohms. Now this is really GOOD news, as I purposefully WANT the interconnect to exhibit a reasonable resistance per unit of length. As soon as I get some further progress on this mini project, I shall append hereto so as to keep you in the know and up to date. If I get to the stage where I can actually LISTEN to this stuff – obviously – will keep you posted on that experience too. Got all four strands ready by now. Next I must come up with some idea as to what topology to use in creating the full run. Should it be braided ? should it be a criss cross XLO style, with some cotton core in the middle ? 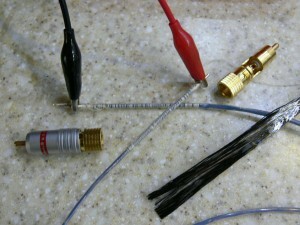 Something coaxial ? Yet something different ? Need to think it over. The cables are ready. Connected to my system. The first initial listening tests are way behind. The initial observations are promising. I will do some more serious listening tests over the weekend.